What started as a dream for Manchester United veterans Gary Neville and Ryan Giggs has now finally come to realisation; Hotel Football is designed as “place for the fans to call their own, to congregate and meet with like-minded people. A place to talk and breathe all things football” (Gary Neville). 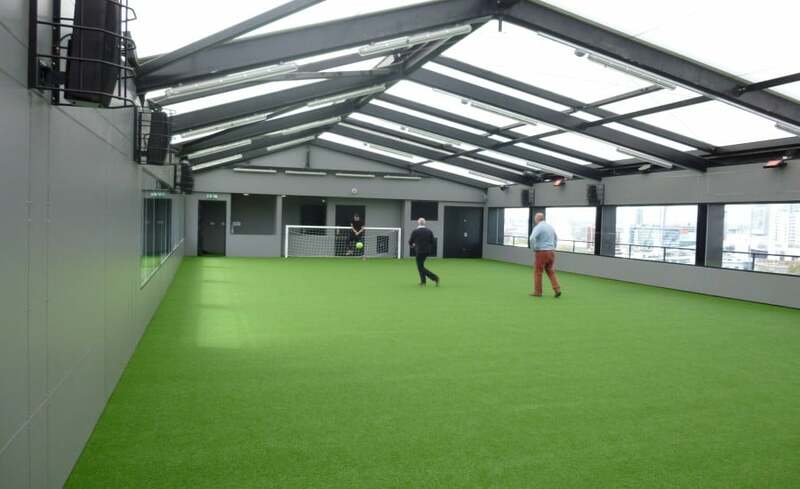 But it’s not just talking and breathing football, playing football is also important as the hotel boasts its own rooftop 5-a-side football pitch complete with a stunning retractable fabric roof. First approached by Xerum Projects, Architen Landrell worked with them to develop a scheme which gave them everything they wanted; an open air space when the weather was good and a light, bright and water tight space when the weather a little more British. From this brief we developed a roof system where 2no. 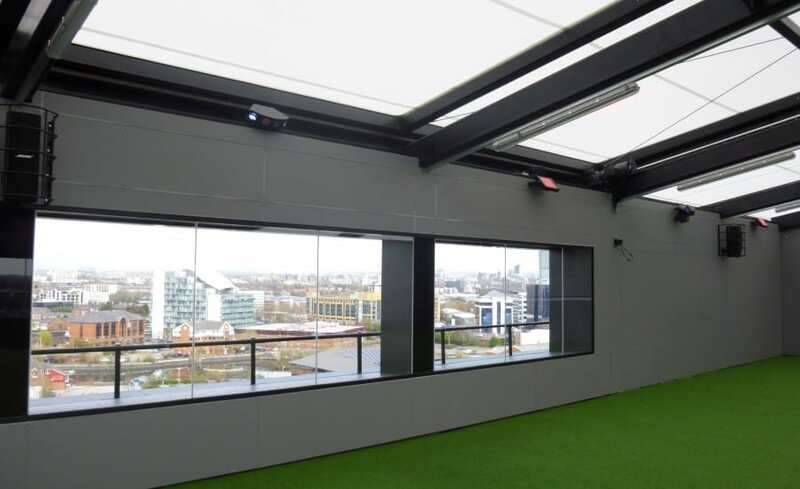 fixed fabric panels and their framing retracted back to leave a 12.5m x 12 open air space. Using complex retractable mechanisms, the panels are remotely controlled and can be closed at the touch of a button should rain threaten. The scheme went to competitive tender but with our expert knowledge of the system and excellent relationship with the client, we were lucky enough to be awarded the contract to manufacture and build the 296sqm roof structure. Designing a system to meet the performance requirements was not the only challenge. Installation also proved to be complex and the footprint of the site only allowed minimal working space. The steelwork was lifted to roof level using a self-erecting tower crane, chosen for its small footprint but ability to lift steelwork 65m up in the air. Once the steelwork was in place, the fabric could be installed using specialist rope access techniques to ensure safe working practices even at 9 floors up! 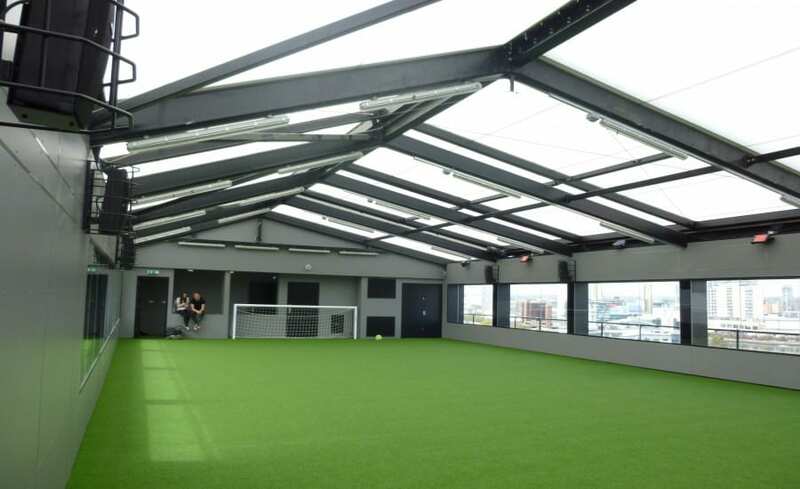 Now complete and open to the public, the rooftop pitch and event space, known as Heaven, offers an amazing view of the fans favourite stadium (located only 200m away) and allows them to hear the roar of the crowd and feel the buzzing atmosphere on match days. The Architen Landrell team are thrilled to have been involved in such an exciting football landmark.